As told by the Eye Witness to History (1998), by 1890 the once proud Sioux Indians found their free-roaming life destroyed, the buffalo gone, themselves confined to reservations dependent on Indian Agents for their existence. In the late 19th century, the job title of Indian agent was to attempt to civilize Indians by assimilating them into American culture. Despite the public scorn for the agents, the Indian Office stated that the “chief duty of an agent is to induce his Indians to labor in civilized pursuits. Of course this was not very popular, especially with the Sioux tribe. the Indians could live in the old way surrounded by plentiful game. 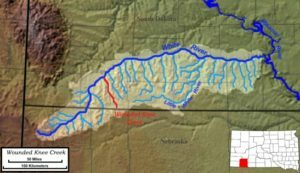 A tidal wave of new soil would cover the earth, bury the whites, and restore the prairie. To hasten the event, the Indians were to dance the Ghost Dance. Many dancers wore brightly colored shirts emblazoned with images of eagles and buffaloes. These “Ghost Shirts” they believed would protect them from the bluecoats’ bullets. 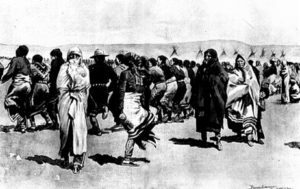 During the fall of 1890, the Ghost Dance spread through the Sioux villages of the Dakota reservations, revitalizing the Indians and bringing fear to the whites. complied. When a trooper tried to size the rifle of one man, Black Coyote, raised his rifle over his head and said he had given money for it and no one was going to take it unless he was paid. A small scuffle ensued, during which a shot was fired into the air (by whom and why is unknown). Panicked, the soldiers took the shot as a sign to open fire on the now-unarmed tribe. 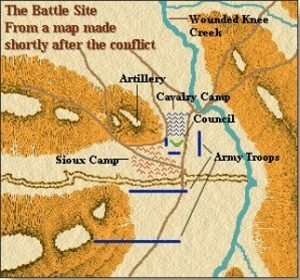 Within seconds the charged atmosphere erupted as Indian braves scurried to retrieve their discarded rifles and troopers fired volley after volley into the Sioux camp. From the heights above, the army’s raked the Indian teepees with grapeshot. Clouds of gun smoke filled the air as men, women and children scrambled for their lives. Many ran for a ravine next to the camp only to be cut down in a withering cross fire. 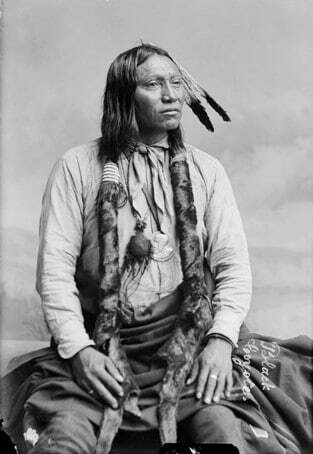 Approximately 300 Sioux were dead, Big Foot among them. Twenty-five soldiers lost their lives. As the remaining troopers began the grim task of removing the dead, a blizzard swept in from the North. A few days later they returned to complete the job. Scattered fighting continued, but the massacre at Wounded Knee effectively squelched the Ghost Dance movement and ended the Indian Wars. 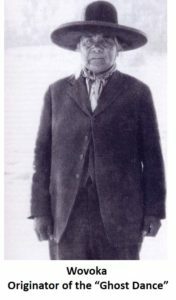 In an account from one of the Indians present that day at Wounded Knee, Charles Turning Hawk, who was sympathetic to the U.S. Government, claimed that Black Coyote was “a crazy man, a young man of very bad influence, and in fact a nobody.” According to Tillett (1976) “One Indian’s gun was fired by accident, it belonged to Black Coyote, Sitting Bull’s deaf-mute son, who couldn’t hear the order to disarm. After that shot, the soldiers let loose with everything they had.” This account was also verified by Iron Hail (later known as Dewey Beard, a 15 year member of Buffalo Bill Cody’s Wild West Show), he and his family were present at the Wounded Knee Massacre, where he was shot three times, twice in the back and some of his family, including his mother, father, wife and infant child were killed. Eyewitness to History (1998) Massacre At Wounded Knee, 1980. www.eyewitnesstohistory.com. Tillett, L. (1976). Wind on the buffalo grass : the Indians’ own account of the Battle at the Little Big Horn River, & the death of their life on the Plains, New York : Crowell. Frederic Remington (1890). Ghost Dance. Western Artist.